Dayne Joyner is a vocalist and actor from Athens, Georgia. He has traveled across the United States and Canada performing in theatre houses and rep companies such as Hale Centre Theatre, Alberta’s Carriage House Theatre, and Feinstein’s 54 Below in New York City. Dayne was most recently seen as Lewis Carroll in the U.S. Regional Premier of Frank Wildhorn’s Wonderland. Other favorite credits include The Music Man, The Crucible, Big Fish, Mary Poppins, and Charlie in The Foreigner. 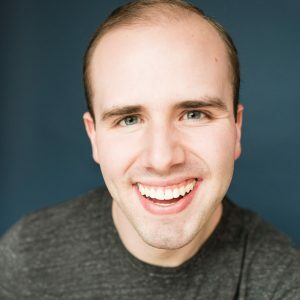 Dayne is a graduating with a BFA in Music Dance Theatre from Brigham Young University in April 2019, and upon graduating, Dayne will move to New York City to continue his career as an actor. When not performing, Dayne enjoys obsessing over cute puppies, daydreaming about traveling to exotic places, and watching the Food Network.